Here are the exciting perks when you gas up with SHELL. 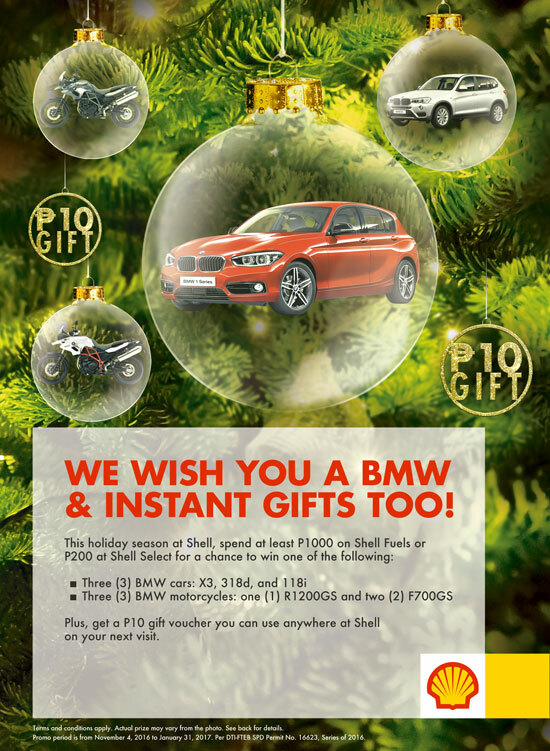 From November 4, 2016 to January 31, 2017, Pilipinas Shell will be giving away six luxury vehicles from BMW. Plus, on everytime you gas up, purchase or avail of services at the station, Pilipinas Shell will automatically give you gift vouchers. The holidays are fast approaching, and a great way to celebrate is to reward yourself with a lavish gift that would surely get you pumped up to take on more exciting journeys in the coming year. 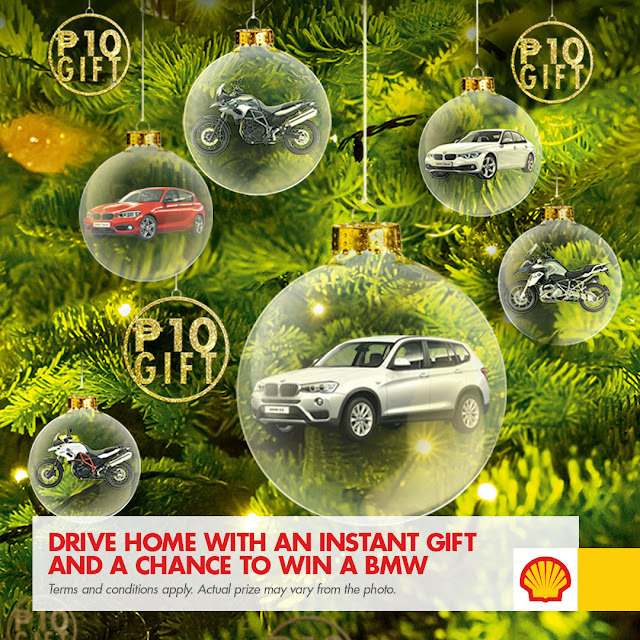 Pilipinas Shell is taking your everyday trips to the next level by giving away luxurious rides this Christmas season. From November 4, 2016 to January 31, 2017, one of six luxury vehicles from BMW can be yours through special raffle draws to be conducted live in selected Shell stations monthly during the promo period. Up for grabs are the BMW X3, BMW 3 Series Sedan 318d, and the BMW 1 Series Premium Hatchback 118i. Three BMW Motorrad motorcycle units will also be raffled off to lucky customers for a different kind of thrilling adventure. Get the chance to ride home a BMW Motorrad R1200GS or one of two BMW Motorrad F700GS! Just drive to participating Shell stations and, with a minimum purchase, join the raffle for a chance to win one of the major prizes from BMW. Along with the raffle entry, you will also receive an automatic ₱10 gift voucher, which can be used on your next visit to Shell. Every ₱1,000 purchase of quality Shell fuels or ₱200 worth of Select or Deli2Go products earns you one raffle entry plus a gift voucher. Shell lubricant purchases are also eligible for this promo. Every 4-liter purchase of Shell Helix Ultra or Shell Helix Ultra D gets you a ₱100 discount voucher; 4 liters of Shell Helix HX7 or Shell Helix HX7 Diesel is equal to a ₱50 discount voucher; a 3-liter purchase of Shell Advance Ultra gets you a ₱50 discount; while a 3-liter purchase of Shell Advance AX7 or a 4-liter purchase of Shell Rimula R4X is equal to a ₱30 discount voucher. By providing quality fuel products and services to motorists around the world, Shell gained its foothold as a global leader in power and energy that pioneers next generation technology in developing new energy sources for a reliable energy mix, producing smarter products as well as promoting its smarter use, building smarter infrastructure and providing energy efficient engineering solutions that ultimately promote clean & efficient transport, sustainable mobility, energy efficiency and a new energy future to address the energy challenge. As Shell continues its commitment to be every motorist’s partner on the road, it offers customers the chance to treat themselves and take their drives to a whole new level this holiday season. For more details on the promo and about Shell’s quality products and services, visit www.pilipinas.shell.com.ph.